I have several email accounts. One account receives a lot of email that does not require my immediate attention. Is there a way to turn off the notifications for this account? This account receives hundreds of emails daily and the constant notifications are distracting. You can't disable notification for one account only (well, at least not in Outlook for Windows), but you can disable notifications for all accounts then create rules to display notifications for the specific accounts you want notifications for. In Outlook for Windows, turn off global notification in File, Options, Mail by unticking Display a Desktop Alert. If you have Play a sound or Show an envelope in the taskbar enabled, you can turn those off too. Next, create a rule for the accounts you want to receive a notification for. Click Next again and complete the rule. 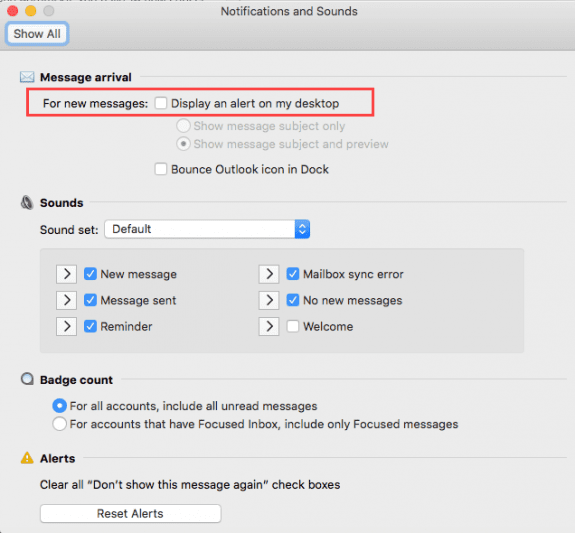 Repeat for the steps for each email account you want alerts on. 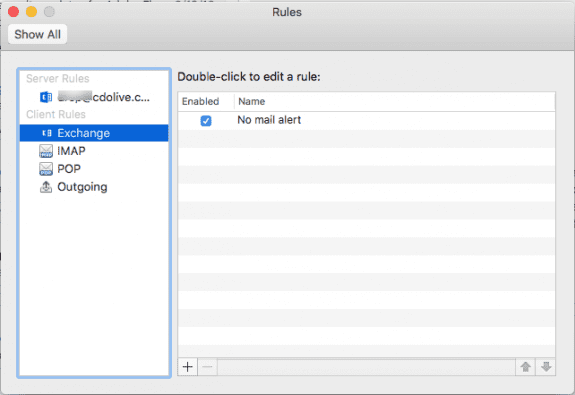 In Outlook 2016 for Mac (and newer) you can create a rule to not display notifications or use the Outlook for Windows method of turning off global notifications and use rules for notifications. Open the Rules dialog (from the Tools menu) and select the account you want to create the rule for. You'll need to create the Exchange account under Client rules to create this rule in Exchange accounts. Choose Account from the list of Conditions then choose your account name. Choose Do Not Notify from the list of actions. Create a rule for each account you want to be notified on. If i remove the alert and set up a rule to only see my inbox new mail will it turn off the notification for everyone if its a shared email account? No the rule wil only run on you're device.